Getting a pilot's license was the furthest thing from her mind – until an ex-RAF instructor suggested that she wasn't competent to do so. The thing is, he could be right. Sylvia has just a few weeks to prove that she can fly as well as any man. “You don't need a real license,” Tom said. The stern-faced ex-RAF instructor had already chided me for dressing inappropriately in my short skirt and open-toed sandals. Now I realized he wanted to get rid of me. A strangled sound escaped me. A wife's license? 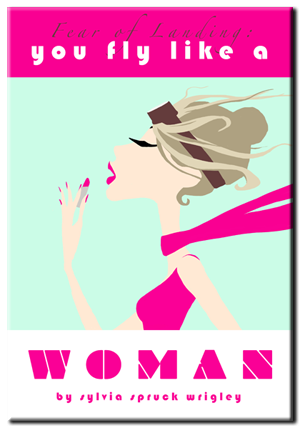 You Fly Like a Woman tells the story of one woman's search for confidence as she stumbles into a man's world. I love the way she captures the emotions faced through the training, the curiosity, the fear of failure, and the drive for adventure. Spare writing, self-deprecating humor and a story arc that has you rooting for Sylvia all the way makes "You Fly Like a Woman" a delightful read. She keeps the technical jargon to a minimum so non-pilots can experience the challenges of learning to fly right along with her. What a great, honest account of flying. Witty, insightful and thoroughly good fun without getting bogged down in tech jargon. That was a short read...didn't realize it but still enjoyed it...funny and refreshing. The setting descriptions are vivid and a good background for the story. It held my interest from beginning to end. An excellent read. Another thumbs up! Fantastic stuff I was drawn in for the whole read. Non-stop! Very entertaining! I could so relate. Bought it, read it, loved it! Best 77p I've spent for ages. When's the next one out? I devoured it in about an hour! So reminiscent of learning to fly back in the 80's when we females were pretty rare in aviation. Always worrying if you were keeping up with the (sometimes quite macho) guys... And even now as a 737 captain I still on occasion get ground staff in some countries talking to the 20something yr old male copilot instead of me - had to laugh about the guy in Almeria who went looking for the real pilot when Sylvia was doing her cross country solo! Come and visit my aviation blog at Fear of Landing or mail me at sylvia@fearoflanding.com.